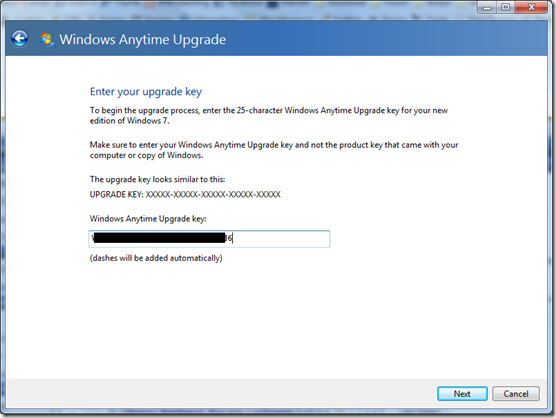 Kemudian pilih Enter an upgrade key. Disini Anda masukan key baru untuk Windows 7 yang akan Anda upgrade. izin nyoba & salam kenal. Thank atas infonya... ane simpen ya, gan. wah, tuk Asus dah ke Fake Gan ! wkakwka. 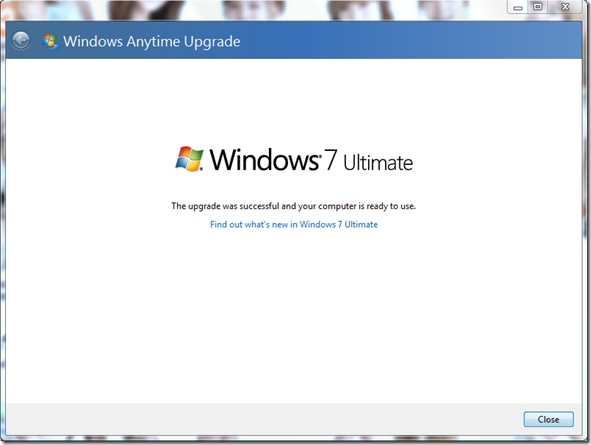 w mw update ke Ultimate dari Win7 Home Preminum ! wah boleh juga nih,dicoba dulu ya sob,salam kenal ..
Om itu yang versi 64bit yang mana ?? apakah otomatis misal awalnya kita sudah guna yg 64bit trus d upgrade akan tetap 64bit ?? kemudian itu key dijamin gak klo gak kena block dari windows'y ?? setelah di upgrate windowsnya tetep ori apa jadi gak ori gan? gan kok laptop saya tulisanya waktu bukak windows anytime upgrade kok gini ya? 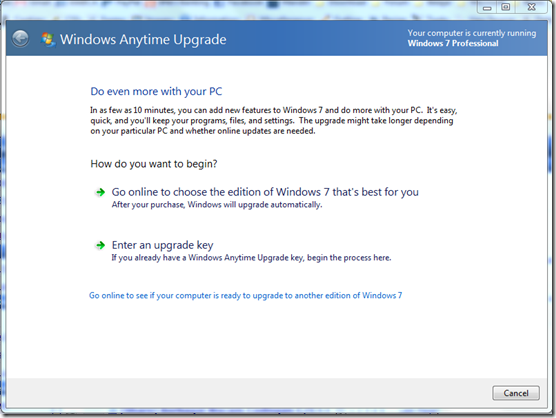 'windows anytime upgrade is not in this edition of windows' ? gan winds 7 saya home basic, layar 14 inch, tapi pentium.. klo mau upgrade bisa gak gan??? trus cocoknya apa ya??? apa key nya buat thosiba gan, mau uprage dari home primium k ultimet ganapa keyx gan?? data 0data gk bisa hilang gk ? gimana cara kasi masuk ulang key sn nya ? apakah semua itu 64 bit atau 32 bit ? sya coba pake home basic di upgrade ke pro bisa ko... yg penting windowsnya sdh diaktifasi..
kog ultimate yang buat acer gakda sihh,.,?? glad to search out a lot of useful information here in the publish, we'd like develop extra strategies in this regard, thanks for sharing. . . . . . I think the admin of this site is in fact working hard in support of his web site, because here every information is quality based information. new comments are added- checkbox and from now on every time a comment is added I receive four emails with the same comment. Hi, I do think this is an excellent website. I stumbledupon it ;) I will return yet again since I bookmarked it. What's up Dear, are you genuinely visiting this web site regularly, if so afterward you will definitely get good knowledge. but generally folks don't discuss these topics. To the next! Best wishes!! I'm hoping to provide something again and aid others like you aided me. Well I'm adding this RSS to my email and could look out for much more of your respective exciting content. Make sure you update this again soon. Excellent post. I was checking constantly this blog and I'm impressed! Very useful info specifically the ultimate section :) I maintain such information much. I was seeking this particular info for a very lengthy time. Thank you and best of luck. gan kok ane gak ada windows anytime upgrade sih??!! Kalau ultimate dah nggak bisa di update. liat di di windows update..
Punyaku kok jadi lemot gila yaa???? gan kalau diupgrade filenya hilang tidak yaa??? kalau windows 7 starter gmn ? Ini gak pake koneksi internet kan? harus sesuai sama merk laptop atau pc nya sob.. tngkyu ya kaka blog maniac buat upgrade win nya, sukses buat blog nya..
upgrade key-nya pada ga bisa semua??? gan,,,,, ugrade nya harus pakai koneksi internet apa tidak ?? File file di data C bakalan ilang gak gan ? Untuk Toshiba gak ada yang ke ultimate ya mas?? Recommend you guys a good site to get cheap and genuine product keys for windows: www.vinhugo.com, all versions of windows keys can be found there. My own experience tells you to get to www.fastbackorders.com to buy, works well and is genuine, there is that it took me a little money, worth buying, recommended to you want to help you. You guys can try this site to get a valid Windows 7 Anytime Upgrade Product Key all editions: www.gankings.com. Love to share my experience. I'd love to share my experience with you, this is where i got my product key: www.motionkeys.com. Partager avec vous les gars un site où vous pouvez obtenir les clés de produit d'origine, mais bon marché pour activer votre bureau 2016: http://www.instructables.com/id/Cl%C3%A9-De-Produit-Windows, il est fiable et le prix est beaucoup moins cher que l'imagination. Go the online store http://www.MsKeyHome.com/ . You even don't need to spend a lot of time but only need to place the order and finish the payment in several minutes. The product key will be sent to you via email in short time. Very efficient! Which worked perfectly to activate my operating system, So I'm so excited to share my experience here. Their customer service is 1st class and I will definitely be recommending this site.